Contagion offers co-operative and PvP game modes set within a number of zombie filled environments. With a decent number of maps and game modes Contagion offers enough zombie gameplay to get your teeth sunk in, leaving you infected and constantly coming back for more gameplay. Contagion offers 3 different game modes which are all multiplayer focused but bring something different to the table. On the one hand players having a free for all deathmatch mode called Hunted which has a last man standing design. With up to 16 players in this mode your only objective is to outlast the other players with different strategies available to players. You can choose to team up with others (and perhaps stab them in the back later on), hold up in a building or take to the streets to actively hunt other players and any zombies you encounter. 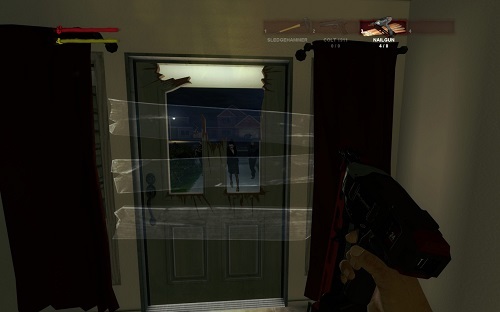 To prevent players getting bored once they’ve been eliminated in the Hunted game mode you’ll respawn as one of the zombies to attack any remaining players. With your brain intact, boosted speed and extra manoeuvrable you’re much more deadly in comparison to the AI especially with the ability to blend in which might lead to the survivors turning their back on you. In addition to Hunted players can enjoy two co-operative game modes, Escape and Extraction which are similar in overall design. In Escape players will complete a series of detailed tasks in order to secure escape for them and up to 7 friends. On the other hand Extraction is similar but requires players to locate and save several AI survivors. These modes emphasise small pools of supplies and significant pools of zombies that ensure success is near impossible without solid teamwork. Ammo is particular scarce which leaves players relying more heavily on melee weapons that put you in harms way. Multiplayer zombie game with three game modes. Mixture of co-operative and PvP options. Great variety of weapons to battle the aggressive undead. Return to “traditional zombies” that requires a focus on headshots and slow moving enemies. Ideal for groups of friends to play together.